Benjamin Franklin is known to have been a man of many talents. Statesman, scientist, diplomat, postmaster, printer, and horticulturist were just some of his titles. Franklin's diverse life experiences also made him a great source of wisdom, much of which he compiled in (Poor Richard's Almanac ). One of the most fascinating yet often overlooked topics within the Almanac is that of love. Franklin's conflicted attitude towards love and marriage was reflected both in his writings and in his personal life. Franklin opted to forgo a ceremonious marriage and instead participated in a common law marriage. He had two children with his common law spouse, Deborah Read. Although Franklin only publicly acknowledged having one illegitimate son, it was widely rumored that there were more, both at home and abroad. His wariness of traditional marriage can be seen not just in his affairs, but also in his writings. "He that goes far to marry, will either deceive or be deceived," and, "Where there's marriage without love, there will be love without marriage" are just two of his aphorisms that express an ambiguity towards the institution of marriage (Poor Richard's Almanac ). Franklin even seemed to express mixed feelings towards love. "If you would be loved, love and be lovable," was tempered by, "If Jack's in love, he's no judge of Jill's beauty." 1. They are smarter, more worldly and better conversationalists. 2. As older women become less attractive with age, they become more subservient and useful to men. 3. One need not worry about impregnating an older woman (and illegitimate children are an "inconvenience"). 4. They are more skilled at maintaining secrecy during an affair. 5. Although the face and upper body are the first to droop with age in women, their lower bodies are still "firm." Thus, simply place a basket over the woman's face and upper body and "regarding only what is below the girdle, it is impossible of two women to know an old from a young one." 6. It is less sinful to have an affair with an older woman. 7. Sleeping with an older woman will make her happy, whereas sleeping with a younger woman might make her feel guilty. 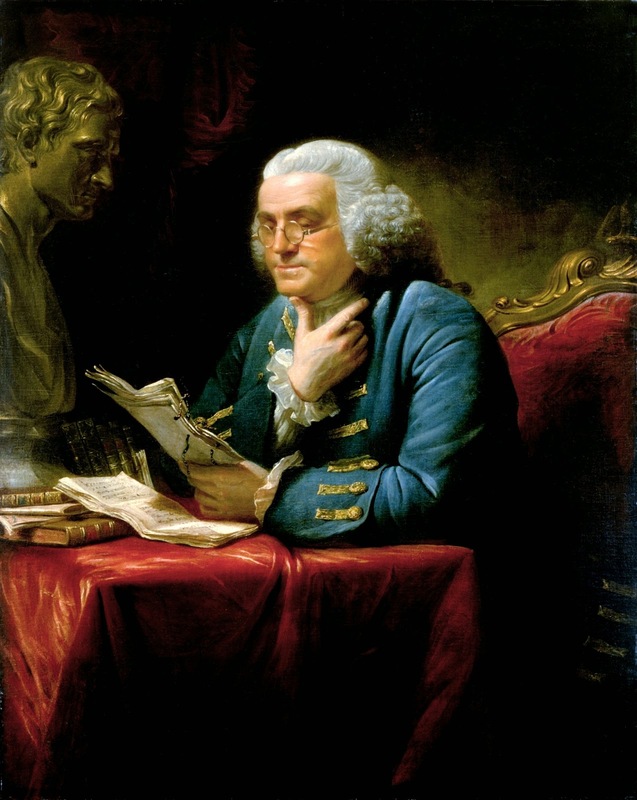 Benjamin Franklin: Proof-reading the Declaration of Independence or editing a dating advice letter? Despite listing no less than seven (quite scandalous) advantages to sleeping with older women, Franklin is careful to cover his tracks by concluding his letter, "But I still advise you to marry directly." Franklin's attitude towards love was conflicted. He praises the virtues of marriage and encourages his friend to wed, yet also provides detailed advice on having affairs. He was married with two children, yet he engaged in affairs and fathered illegitimate children. Through these actions and writings, Franklin perhaps reveals the true nature of love and marriage - that they are indeed paradoxical.